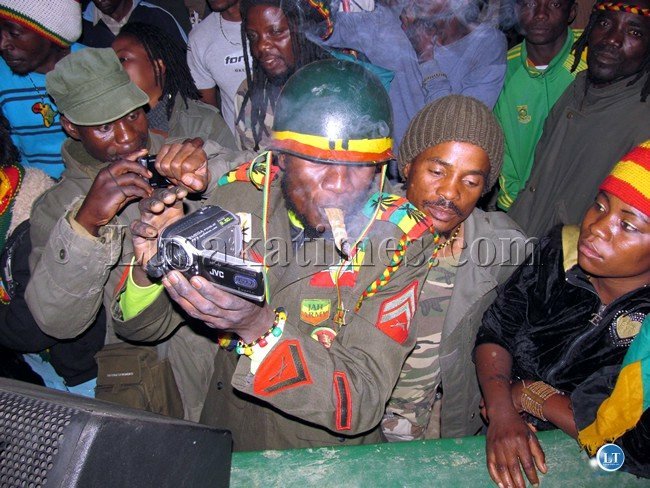 FILE: An amatuer video producer takes time to smoke marijuana during the Bob Marley Memorial concert in Lusaka west. The Green Party says it will not stop its campaign for the legalization of Marijuana. Green Party Leader Peter Sinkamba has maintained that Marijuana is the best way to go if the country is to generate more income. “As the green party we have a task to sell the green agenda by not joining any politics on the constitution making process but ensure that marijuana is legalized. The constitution making process is not worthy following because of the past experiences with the failed commissions to come up with a people driven constitution, Mr. Sinkamba said”. He says the green party is determined to sell the agenda of legalizing marijuana so that the country can earn a minimum of US $ 15 million to the economy and bring in cheaper medicine for the Zambian people than fighting over the constitution. “This is the only way that we can create employment for the people and make medicine available for every citizen, he says. “u know marijuana is used for many things including the provision of medicines hence the need for it to be legalized and get the benefits that will help the country make its own medicines, Mr. Sinkamba says. Meanwhile Mr. Sinkamba says the PF has failed to govern the country by not allowing the opposition to freely express their views. “I think the PF government in two years have only achieved the arresting of the opposition, adding that the PF can do better after going through the harassment when in opposition. “the conduct of the PF to harass the opposition is a recipe for violence as the opposition will not sit and allow the government attack them.” Mr Sinkamba said. Mr. Sinkamba said the green party does not want the country to be in any civil war but continue to be the oasis of peace. This is my party.Lets go Sinkamba. The party of the future. I wonder why the DEC and police risked their lives after being beaten up in Chibolya for conducting an unwelcome operation there when they ignore this Peter Sinkamba ldiot. Suntwe, obviously you do not know how the law and democracy work. To be arrested for “drugs” you have to be in possession. Those guys in Chibolya were in possession. To advocate the legalization is not a crime. It is an expression of opinion and is protected under the freedom of expression/speech. You probably do not know the meaning of the word ***** either, or then you are consumed with hate. Legalize it ! Me love to start my day with a joint.It calms me and makes me to perform well at work. The Green Party has my vote. If we can copy the Holland model of running things, we’ll be good to go. Livingston could be the Zambian Amsterdam. Tourists would love it! Absolutely. Zambian-Malawian-Zimbabwean weed is legendary already. Everyone knows Malawi Gold, and there was a company in South Africa back in the day that sold seeds called Kariba Surprise, Malawi Gold, and Zambian Copper. Unique in the world, in it’s type of psychedelic properties. Very unlike the indoor grown varieties that flood coffeeshops and dispensaries. I guess there is nothing like the tropical sun to grow under too. Excellent – one issue, and stick to it. Like chasing down people with the wrong papers in apartheid south africa, distracting the police with checking whether people are in possession of hemp, takes them away from finding and jailing murderers, rapists, theives – real crime. As a result, crime levels are higher than they are supposed to be and could be. Think of all the police time, court time, and jail cells filled with non-violent hemp offenders. When a substance as benign as hemp is made illegal, respect for the rule of law is undermined with every arrest. People know that hemp is not as bad as murder or robbery, and yet they receive the same jailtime. People know that alcohol and aspirine are far more deadly than hemp. Also, it treats real addicts as criminals instead of patients with a medical problem. Hemp is used for a huge variety of ailments, including – nausea, common cold, pain. And with no side effects, unlike chemical pills (which is why you often get pills just to counteract the side effect of the pills you get for what’s ailing you – it is a corporate business model). Hemp could feed and clothe the nation. Hemp fibers are notoriously strong and create the only clothing that becomes softer after wearing it for a time. Hemp seed is more nutritious than soy. Hemp planted close together like reeds can drain swamps. It also produces more cellulose per hectare than forest – a boon for the paper industry. Hemp can be made into anything from clothes, to paper, to containers, to shoes, to rope, to cars. Now that’s strength – you can take a sledge hammer to it, and no dents if the car body is made of hemp fibers. And it is much lighter than steel. The moment I saw the headline, I knew that for the first time rival bloggers will speak with one voice. Very interesting comments. Yaba hahahahahahahahahahaha. I won’t even comment. I can say that legalising would be a good way to benefit your country. When I saw the headline I had interest to read through but after the leader discounted a good constitution for Marijuana I had problems with the article and the Green partys’ Ideology. The countries that have legalized Marijuana had to first deal with a good constitution which guarantees civil liberties. In our case we have a big constitutional problem which we must solve first. Bwana sinkamba, you do not go to grade two before you pass your grade one unless you have a noteworthy educational system. In short lets sort out our constitution issues and then move on to your greens. Other wise the constitution issues will catch up with your Marijuana. As a Jahwoman i d like to get in touch with our party president so that we start campaigning now. There is no time. we need it to be legalised now. Twachelwa no kuchelwa. presido we support your vision. The reason marijuana is illegal in Zambia and beyond is not because of any negative impact to the environment or human health, but exactly the opposite. It is so environmentally friendly, nutritionally and medicinally beneficial, that it provides too many abundant resources which would make it impossible for powerful corporations to compete. Let’s improve Zambia’s social economy…………go GREEN…..Legalize it…..Tax it…..Grow the economy by $15 billion ………………………………………………..